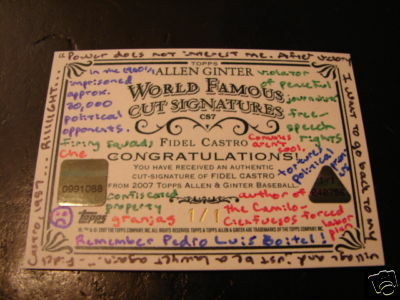 The owner of the card apparently disagreed with Topps’ inclusion of a Castro cut auto in its product, and covered the front and back of the card with his own social commentary towards the Cuban Dictator. In most cases, drawing on the surface of a card will completely devalue it, but I’m not sure that holds up in the case of the Castro cut signature. 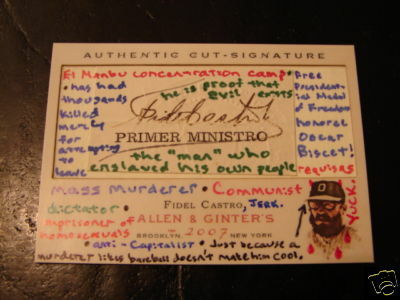 As far as I know, it’s the only certified Fidel Castro cut signature to be released, making it truly one-of-kind. Some people will probably consider this card “ruined” and worthless. Personally I think the inscriptions on the card make add to its uniqueness, and I’m sure that it will fetch top dollar. According to the Auction text, all proceeds from the auction will be donated to the Center for a Free Cuba. Bookmark this page: These icons link to social bookmarking sites where readers can share and discover new web pages. This entry was posted on Tuesday, June 3rd, 2008 at 3:36 pm	and is filed under Cool Cards. You can leave a response, or trackback from your own site. I realize this was a long time ago now, but do you have any idea how much this wound up going for? Excellent, what a web site it is! This website presents valuable data to us, keep it up. Excellent web site. Lots of helpful information here. I am sending it to several pals ans additionally sharing in delicious. And of course, thank you to your sweat! Attractive part of content. I simply stumbled upon your weblog and in accession capital to claim that I acquire actually enjoyed account your weblog posts. Any way I’ll be subscribing on your feeds or even I fulfillment you get admission to constantly quickly. The Card Blog is proudly powered by WordPress.